The Meiji Restoration modernized feudal Japan at a remarkable rate. However, you do not revolutionize society without breaking a few eggs. The samurai class were most definitely among those with broken shells. However, the Meiji government will learn a few samurai can be handy to have around when a super villain threatens the new peace. The former Killsword Kenshin Himura (a.k.a. Hitokiri Battosai) was supposed to be their stopper, but the megalomaniacal Makoto Shishio got the drop on him in the previous film. 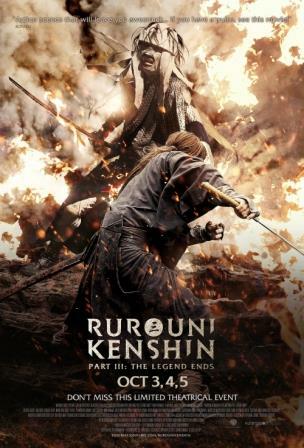 One way or another, the epic proxy battle or Japan’s future will decided in Keishi Ohtomo’s Rurouri Kenshin: The Legend Ends (trailer here), which starts a special three-day engagement in select theaters this Monday. Picking up exactly where the Kyoto Inferno cliffhanger left off, we join Himura where he has washed up on shore. We quickly learn the mystery figure dragging away his battered body is his old master, Seijuro Hiko, who will nurse the hero back to health in the safety of the Dagobah Swamp. Kaoru Kamiya is presumed lost at sea and Himura’s new allies in the underground Oniwabanshuu have turned against their former captain, the deranged Aoshi Shinomori. That even includes Megumi Takani, who once loved Shinomori (and probably still does), but is now more concerned with the grievous injuries her grandfather Nenji Kashiwazaki suffered in his duel with Shinomori. Himura is understandably anxious to face Shishio again, but Hiko will force him to undergo a transformative training regimen first. While Himura is sidelined, the armed skirmish threatens to become an all-out war, when Shishio’s ironclad warship starts strafing coastal cities. Eventually, Himura will have his showdown with Shishio in the spectacular battle fans of the franchise deserve. It would be spoilery to say just who shows up for the climatic sword fight to end all sword fights, but the mix of styles and temperaments makes it enormously cinematic and hugely satisfying. Words like "rousing” and “crowd-pleasing” don’t do the third act justice. It also underscores just how much the large supporting cast contributes to the franchise. Takeru Sato plays Himura with stone cold resolve hitherto unseen in the trilogy, but maintains his ambiguous endearing chemistry with Emi Takei’s virtuous yet down-to-earth Kamiya. Memorably capitalizing on limited screen time, Yosuke Eguchi is so massively hardnosed, he makes a compelling case for a Hajime Saito spin-off series. Likewise, Yu Aoi appeals to our fanboy emotions in the right was as the good doctor Megumi Yakani. Yusuke Iseya was also good as Shinomori in Inferno, but the way he steps it up in Legend Ends really makes the film a trilogy-closing homerun. It is hard to not sound fannish when a Chanbara series (Meiji setting not withstanding) ends on such a high note. Action director Kenji Tanigaki keeps the inventive swordplay coming and the charismatic cast keeps us deeply invested. 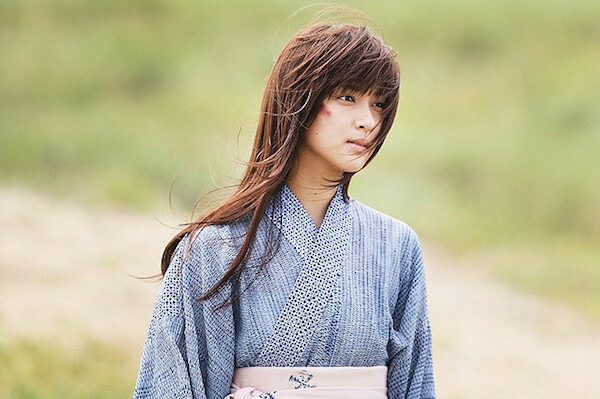 Very highly recommended for fans of samurai and manga-inspired cinema, Rurouni Kenshin: The Legend Ends screens this Monday, Tuesday, and Wednesday (10/3-10/5) at select theaters, including the Village East in New York.